Two of the most widely practiced boxing sets in the Shaolin area today will almost certainly be part of the training curriculum at any Shaolin school. These two sets are known as Qixingquan and Changhuxinyimenquan. The style of these sets is of a distinct 'rooster' characteristic differing from other Shaolin material. The following article offers just a brief introduction to the history of the Songshan sect to which these sets belong, as well as a look at and explanation of its unique content. Sect Founder: Li Jiyu (李际遇), a coal miner turned rebel in the 17th century (late Ming Dynasty), notorious for having led a large peasant revolt. His hometown and sanctuary was in Mogou village (磨沟) in Songshan where he learned the Shaolinquan of Mogou, part of the Shaolin Western Courtyard (Chin. : Xīyuàn 西院) martial arts which had been separated from Shaolin Monastery at the time for over 100 years (now about 500). 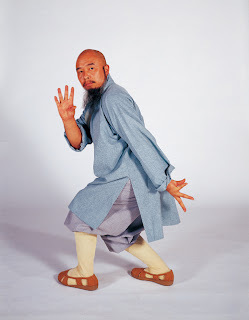 As recorded, he insincerely made "friends" with the Shaolin monks, offering them loads of resources and learned their wugong at Shaolin Monastery Yonghuatang, aka. Shaolin Southern Courtyard (Chin. : Nányuàn 南院). Concerned the monks would side with the Emperor, as they did in the past, he planned a massacre in the early 1640's. When they were known to be in ritual— as he asked them to gather in the hall to commemorate his birthday— he and his men swept down on them on horseback, entering the hall and killed over 200 of the monks. This soon led to the monastery being closed down and abandoned for several decades. However, this is also around when much of extant Shaolin arts were spread to surrounding villages, such as Ruan village (阮村) Nanyuan which separated roughly 360 years ago. The peasant uprising was suppressed by officers of General Chen Wangting (陈王廷) of Chen Village, who was actually cousin to the Li family. This gave opportunity to inspect Shaolin manuals and incorporate them into the corpus that formed Chen Style Taijiquan. It is also said at a time Chen Wangting accompanied Li Jiyu in studying in Yonghuatang, learning 'xuzhuang' (empty stake) and other skills of Xinyiba (心意把). But this is another story. Li Jiyu at the time had learned Mogou Xiyuanpai and Shaolin Nanyuanpai wugong and also learned the teachings of Ji Jike (姬際可) when he visited Shaolin. Here we must pause for a brief background on Ji Jike. Ji Jike, a native of Shanxi Province, started training martial arts at the age of 13. When he was 18 both of his parents passed away in close succession. Two years later he developed an interest in Shaolin Monastery's fame, and at the age of 20 made his way alone on horseback to Shaolin, on the path to which is Qianzai Monastery (千载寺), where he would have learned the Full-arm Boxing (Chin. : Tōngbìquán 通臂拳) and Six Harmony Spear methods (Chin. : Liùhéqiāng 六合枪) of Priest Dong Cheng (董成), a 16th century Taoist and Buddhist practitioner who had learned Shaolinquan from students of Bai Yufeng (白玉峰), the famous restorer of Shaolin martial arts in the early 1500's. Mixing his Shaolin Hongquan, Paoquan and Taizu Changquan with long arm gibbon movements of Yuanhouquan (Ape-monkey Boxing), Dong Cheng created his early Tongbiquan, seen today as Southern Courtyard Stitching-hands Long-arm Boxing (Chin. : Nányuàn Rènshǒu Tōngbìquán 南院纫手通臂拳). With this new experience and material, Ji Jike continued on horseback to Shaolin Monastery. On the way, it is recorded, while crossing the mountains his horse lost its footing and fell to the valley bellow. Fortunately, Ji Jike was able to scale the cliffs to safety and eventually made it to Shaolin Monastery to study where he stayed for 10 years (roughly 1622-1632), as the abbot was also impressed with his skill and asked him to teach. Now, later in the 1630's is when Shaolin's anti-Qing activities were getting stronger. Monks were regularly drafted against the troops of Li Zicheng (李自成 1606-1645) and Zhang Xianzhong (張獻忠 1606-1647). Eventually their anti-Qing tendency led to the destruction and massacre at the hands of Li Jiyu. What Ji Jike taught at the time was called Xinyi (心意 Mind-intent) in Shaolin and incorporated Priest Dong Cheng's Tongbiquan theories as well as Ji Jike's newly developed 'rooster style' based on a cockfight he had witnessed while reading outside the monastery which got him thinking. Later interactions elsewhere with Ji Jike and his students led to the development of Xingyiquan/ Xinyi Liuhequan (形意拳/心意六合拳). 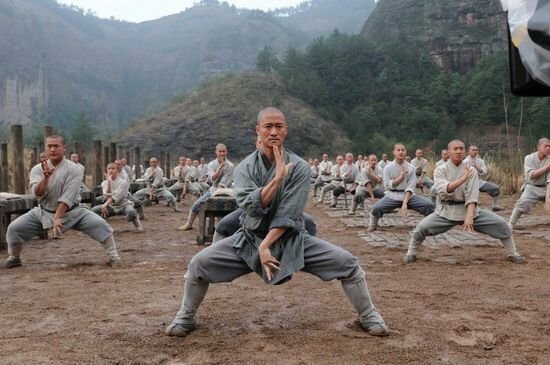 Back at Shaolin, Li Jiyu took the new Xinyi elements and mixed them with Shaolin Nanyuan and Mogou Xiyuan styles he knew to create a new sect called Changhuxinyimen (长护心意门), meaning "Constant Protection of the Xinyi Sect". After the Shaolin Monastery had been restored, in the early 1700's students of Ji Jike visited again and shared with the abbot what became Xinyiba (心意把) in Shaolin- yet another important branch of Ji Jike's heritage within Shaolin. The material of Li Jiyu's Changhuxinyi sect is generally made from pulling Mogou and Shaolin Monastery sets and adding Xinyi to them, often using rooster, tiger, and snake hand and body methods. Hand shapes include the rooster claw also called 'fengshou' (风手 wind hand) for the splayed fingers, as well as tiger claw, and 'goushou' (勾手 hook hand, like crane's beak) which represents a rooster's head. The representative boxing set of the Changhuxinyimen is Changhuxinyimenquan which uses Mogou Xiaohongquan (小洪拳 Small Flood Boxing) as a template combined with Xinyi (Dong Cheng's Tongbi + rooster) elements. In this sect it is a Muzi (母子 mother & son) set with Qixingquan (七星拳 also called Qixingba 七星把), which in other Songshan sects is separate, unrelated, and in fact quite different. The following sets also have non-Changhuxinyimen versions that exist throughout the Shaolin area. Much of the same technique set will be noticed throughout these routines as done in this sect. Some of these sets, like many others, were only recently brought back into the Shaolin Monastery by practitioners in the surrounding Songshan area. Today the Xiyuan version of Xiaohongquan is still practiced in the Mogou village where it has been virtually unchanged since villagers were not trying to refine it, frozen in time for the past 500 years. Looking at this version of Xiaohongquan one can clearly see the template upon which Changhuxinyimenquan was designed, and even the current Shaolin Xiaohongquan, primarily Nanyuan. It was merely a matter of adding Xinyi rooster elements to it. Now the interesting question. Since this is the wugong of a rebel sect responsible for the massacre of Shaolin's monks and the destruction of the monastery, is it ironic or suitable for it to be the most widely practiced material in Shaolin today? It even featured heavily in the 2011 film Shaolin or The New Shaolin Temple (新少林寺) as it was named in its Asian release, a film made with the blessing and input of the monastery. In any case, it is a powerful style and fortunately today we seem to be beyond such warring eras and are in a flourishing period. Long may this time of peace last. Copyright © 2013 Shaolin Chan City, LLC. All rights reserved.